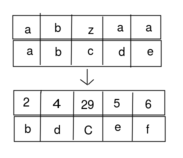 Let's define the weight of an English letter (lowercase or uppercase) in the following way: a has weight 1, b = 2, and so on until z = 26; A = 27 and so on until Z = 52. The weight of an alphabetic string is the sum of weights of all letters it contains, modulo M.
Next, let's define the sum of two strings X and Y of length N consisting of lowercase English letters as a string Z of length N such that for each valid i, the weight of the i-th character of Z is the sum of weights of the i-th characters of X and Y. For example, the sum of strings "abzaa" and "abcde" is the string "bdCef". You are given a string S of lowercase English letters with length N and two integers M and K. You need to select a string B (also consisting only of lowercase English letters) such that the sum of strings S and B has weight K.
Can you find the number of ways to select the string B modulo \( 10^9+7 \)? The second line contains a single string S of length N.
Print a single line containing one integer — the answer modulo \( 10^9+7 \). One possible string B is "abucdef". The sum of "abcacba" and "abucdef" is "bdxdggg". The weight of this string is \(2+4+24+4+7+7+7 = 55 \equiv 13 \) modulo \(21\). Note that \( M = 21 \) in the sample. This is strictly for explanatory purposes; the constraint \( 10^5 \le M \le 10^9+7 \) will hold in all real tests.